Every aspect of ancient Egyptian society - from education and law to medicine, birth, and death - was permeated by religion and magic, and dominated by divine life forces of the sun and the Nile. In this fascinating work, Rosalie David reveals the complex and intriguing world of gods and goddesses, tracing the history of Egyptian faith practices from the civilization's beginning through its growth into an empire and its later years as a Roman province. Concluding with a glossary and including new translations of Egyptian spells, this is an essential work for students, scholars, or anyone fascinated by the ancient world. Rosalie David is a Professor and Keeper of Egyptology at the Manchester Museum, University of Manchester. 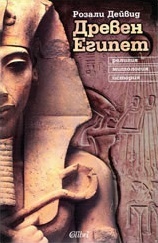 She has taught university courses on ancient Egyptian religion and has edited or authored more than twenty books.